We make our chatbot capable of exchanging arguments with users. The chatbot needs to tackle various argumentation patterns provided by a user as well as provide adequate argumentation patterns in response. To do that, the system needs to detect certain types of arguments in user utterances to “understand” her and detect arguments in textual content to reply back accordingly. Various patterns of logical and affective argumentation are detected by analyzing the discourse and communicative structure of user utterances and content to be delivered to the user. Unlike most argument-mining systems, the chatbot not only detects arguments but performs reasoning on them for the purpose of validation the claims. We explore how the chatbot can leverage discourse-level features to assess the quality and validity of arguments as well as overall text truthfulness, integrity, cohesiveness and how emotions and sentiments are communicated. Communicative discourse trees and their extensions for sentiments and noisy user generated content are employed in these tasks. We conduct evaluation of argument detection on a variety of datasets with distinct argumentation patterns, from news articles to reviews and customer complaints, to observe how discourse analysis can support a chatbot operating in these domains. 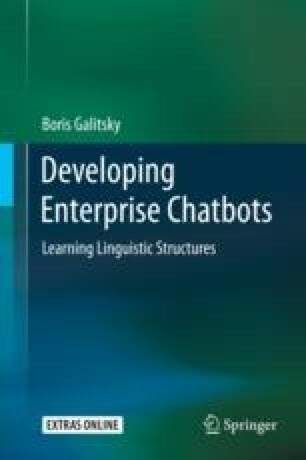 Our conclusion is that domain-independent discourse-level features are a critical source of information to enable the chatbot to reproduce such complex form of human activity as providing and analyzing arguments.